Quilting can be challenging for first timers. Piecing with quarter inch seams is an exacting process, and if you make a mistake all the world can tell from the mismatched points. Then there's designing the quilt. Will these fabrics look good together? What should I use for a pattern? How much fabric will I need? How long will it take? 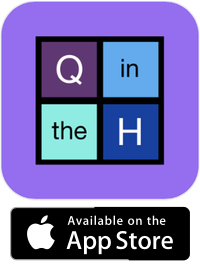 Using our Quilt in the Hoop app on your iPad answers all those questions. Design your quilt with our easy-to-use tools. Enter your fabric stash from photos so you can see what your quilt will look like before you take a single stitch. Print the optional templates, then download one of the 35 included embroidery designs in JEF, or PES format to stitch using the embroidery features of you Janome, Brother, or BabyLock embroidery machine having a hoop that is 5" x 5" or larger. Neither the Janome Sewing Machine Company, Ltd. of Japan, nor any of their subsidiaries had any part in the making of Quilt in the Hoop and they are not responsible for its content. Click the Support link in the sidebar for help or pre-purchase questions.